Check out the latest episode of Thoughts on the Table, the podcast on food and food culture. Also available on iTunes and Google Play Music. Pasticcini are exquisite Italian fine pastries which have been perfected over the centuries to achieve the best flavors, textures, and fragrances. In the Italian tradition, assorted pasticcini are served as a dessert, as a treat to accompany coffee, tea, or hot chocolate, or as a cake alternative for celebrations and other special occasions (in which case they are usually accompanied with ‘spumante’, the Italian sparkling wine). The word ‘pasticcino’ is a diminutive of ‘pasticcio’, which in turn derives from Vulgar Latin pasticium, a dish made by mixing various ingredients, mostly wrapped in dough (‘pasta’). Pasticcini can be found in two sizes: standard (2-3″ in diameter) and mignon (1-2″). The latter has become increasingly popular thanks to its sampling size, a definite plus, given the great variety of pasticcini. 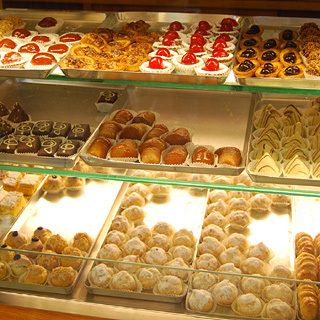 Since fine pastries are difficult and time-consuming to make at home (especially if a variety of kinds is desired), Italians prefer to buy them fresh in a ‘pasticceria’ (pastry shop). Although some bakeries also sell pasticcini, most pastry shops are independent specialized stores, have extended opening hours (they’re often open on Sunday mornings, for any last minute pastry pickup), and sometimes even double as coffee bars. 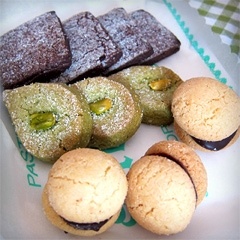 A small tray of paste da tè: chocolate and pistachio shortbreads, and ‘Baci di Dama’ (Ladies’ Kisses), a traditional Piedmontese cookie made of two crumbly hazelnut or almond halves held together with a layer of dark chocolate. 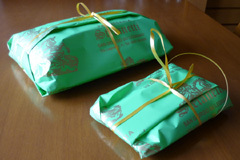 Along with pasticcini, pasticcerie often also sell shortbreads and other kinds of cookies and dry pastries. Those, however, are called ‘paste da tè’ (tea pastries) and are considered a distinct product. Nevertheless, pasticcini and paste da tè are often served side-by-side to appeal to every palate. The Italians are traditionalists when it comes to food, and pasticcini are no exception. As an interesting consequence, it’s on traditional pasticcini that most pastry chefs showcase their best techniques. Every pastry chef needs to know how to execute them flawlessly since it is on them that they are evaluated by their customers. There are several kinds of traditional pasticcini. Some are available all throughout Italy, some are exclusively regional, and some are only made during particular times of the year. The following can be found nationwide (although some have strong regional origins). Cannoncini (cream horns). Among the most popular pasticcini. Made with a baked horn of puff pastry (‘pasta sfoglia’), generally filled with pastry cream (‘crema pasticcera’), which may be chocolate or hazelnut flavored. They are not to be confused with ‘cannoli’ (see below), although they sound similar because both of their names derive from ‘canna’ (reed), which they resemble. Bigné (cream puffs). Also extremely popular. Made with choux pastry filled with pastry cream (vanilla, chocolate, coffee or hazelnut flavored), with Chantilly cream (vanilla-flavored whipped cream), or with zabaione. Sfogliatelle Napoletane. Made of a shell similar to the Greek phyllo dough and filled with ricotta and candied peel. Originally from Naples. Crostatine alla frutta (fruit tarts). A base of baked shortbread, with a layer of custard, topped with fresh fruit, often covered with gelatin. Crostatine con Marron Glacé (Marron Glacé tarts). Babà. A spongy cake dipped in sugar water and rum. Also traditional to Naples, though with Polish origins. Cigni (swans). Bigné which have been cut in half and filled with pastry cream (on the bottom) and whipped cream (on the top). A small squiggle of puff pastry is then applied on the bigné to form the neck and head of a swan. Cannoli. Made of a fried shell, with a ricotta-based filling and flavored with candied citrus peel or chocolate chips. Originally from Sicily. Fiamme (flames). Drop-shaped mousse (thick foams, generally chocolate-based), on a wafer or a shortbread base, usually covered in chocolate. Tronchetti (small trunks). Rolls of sponge cake and mousse, which are then sliced in cylindrical sections. Tartufi al cioccolato (chocolate trouffles). Chocolate and coffee ganache covered in cocoa powder. Mini strudel. A small version of the Austrian/German strudel, a kind of pastry filled with apples, raisins, and pine nuts. Cassatine Siciliane. A small version of the Cassata Siciliana cake, a dessert made with sweet ricotta, sponge cake, almond paste, and candied fruit. Originally from Sicily. Chiavi di Violino (treble clefs). Liqueur-drizzled sponge cake layered with cream, covered in dark chocolate and decorated with a treble clef made of white chocolate. Diplomatici. Layered puff pastry, sponge cake, and custard, which is then cut in squares and sprinkled with confectioner’s sugar. Meringhe(1). Two crisp meringues enclosing a heart of whipped cream. A basket of pasticcini (2-3 mignon per person) is also a common hostess gift. I love pasticcini! They are the perfect Sunday treat! Thanks Pola, I absolutely agree! Hello Paolo, I’m currently in Catania Sicily and bought these pastries already packaged from a super market here they are called Tronchetti they are filled with a fig filling but the pastry has sure a beautiful taste like if it has some sort of liqueur in the pastry and has a yellowish colour to the pastry. I’m Australian born but my parents are from Puglia. I’m very interested in Italian cakes and pastries as I love baking and cooking. If you or your fans have any idea what this pastry is I would appreciate the recipe. Thank you. 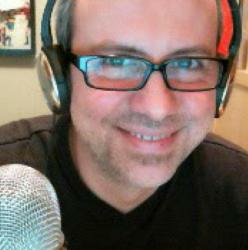 Hi Ignazio, thanks for your question. I’ll do some research and let you know! ciao Paolo. really useful this description of what we mean for "pasticcini". I posted on how to make "pastarelle", the way we Romans call bigne', and it was really lovely to taste them once again (and home-made, for once). love the picture with the wrapped pasticcini, just as I remember we used to do on Sunday afternoons. Thanks so much for your comment! I saw your post on the Roman pastarelle, they look fantastic – you did an amazing job 🙂 I don't know if I would dare to make these at home. I had no idea that baba’ has Polish origins! Do tell more! Thanks Frank for stopping by, it's a true honor. You are right, there's a lot more to say about pasticcini, there will be a follow up post for sure. I have cravings now after seeing this ! Are the Tartufi al cioccolato the same as what we call Funghetti? Hi Marta, I did some research and it seems that Funghetti are more of a bigne’ (choux) filled with chocolate cream and then covered with cocoa powder. Tartufi instead are a ganache (mix of cream and melted chocolate) covered in cocoa powder. Paolo, how about meringhe? It was one of my favorite pasta when I was a kid: two crisp meringhe enclosing a heart of whipped cream. Thanks Simona, absolutely! I've added it to the list. Anything else that I missed? 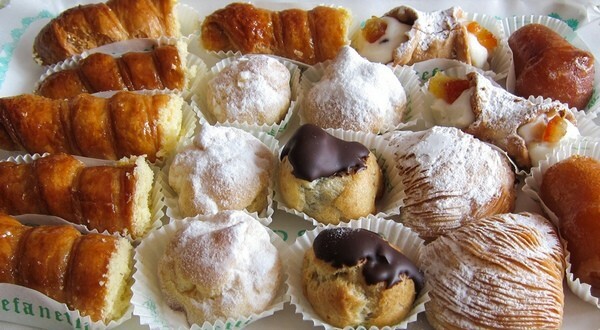 Also are any of these traditional pasticcini known under other names in the different regions of Italy? Some serious drooling here! I want to eat them all!!!!! I will eat them all, maybe not all but definitely some!! :-)))) And then I will go running for 2 hours!! Oh, those Sfogliatelle Napoletane (lobster tails) look good, and cannolis, well, everything! Thanks bellini for your comment, I actually don't know "limoni"… I have to remedy that!